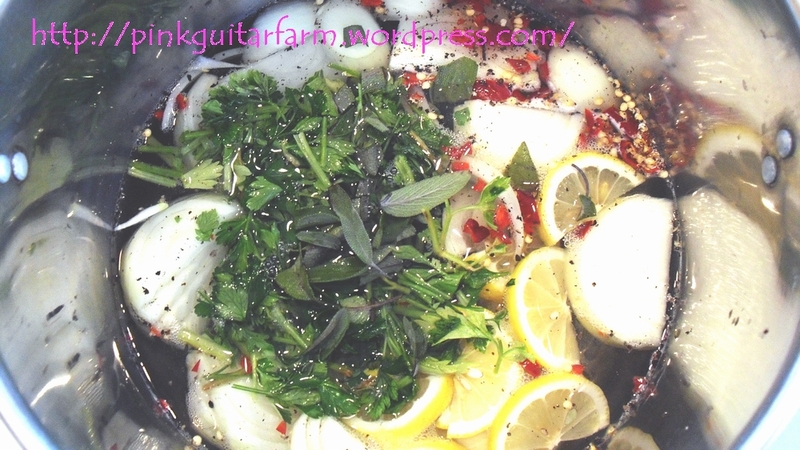 When I started growing vegetables I wanted things I couldn’t get easily at the store. I wanted weird stuff that no one had ever seen and to make dishes nobody else had ever tasted. I’ll admit it, I’m a food adventurer, a trait encouraged and nurtured while only a 10 year old child on sabbatical with my family as we traversed around the world. We lived in Japan and Sweden during that journey for six months each and it was immersion into these cultures, and others along the way that opened my eyes to so many wonderful choices in food. Heirloom fruits and vegetables are therefore an obvious component in my garden. 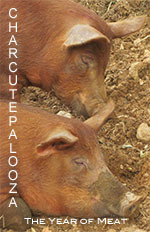 So too, are heritage farm animals, which brings us to the elusive and extraordinary Red Wattle Hog or Pig, depending. And really, just what is the difference between a hog and a pig? Just like heirloom plants, heritage animals must be consumed in order to continue on. If there is no added benefit in the form of taste, better flavor, hardiness, regional adaptability, or an incredibly unique finished product, they will not survive our industrialized world. And if you have read this far, please check out this post a story regarding Adam and Eve, two 8 week old Red Wattles that traveled from Kansas to live in the Napa Valley. Especially thought provoking, are the comments in this link, there are excellent rhetorical questions posed and insights revealed. Luckily, the Red Wattle population is increasing and most Red Wattle farmers are passionate about their cause. Although touted as a trendy foodie item for several years (yet again, another Adam and Eve reference), I hope that more people have the opportunity to taste heritage meat and learn about these animals with an eye towards preservation, animal welfare and excellent flavor. To know that meat raised the way it is supposed to be raised has better flavor and that more small farmers are supported in doing so, is a win, win situation for all local communities. Raising Red Wattle Hogs is an honor. We have Yorkshire/Landrace/Hampshire cross gilts alongside the Red Wattles and the Red Wattles appear to be more primitive and old-fashioned. 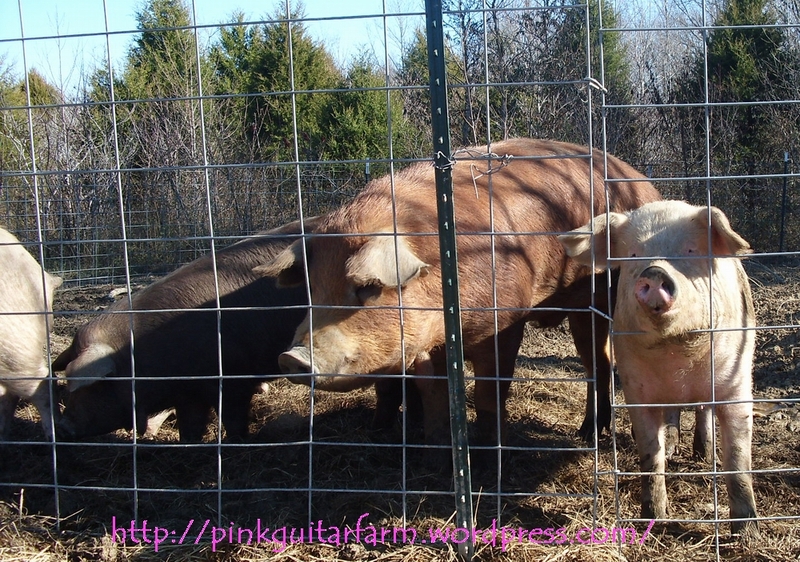 They are larger, grow faster, forage better, hold up to the weather and thrive in the woodlot and pasture. The Red Wattles have been referred to as dinosaurs and, I’ll admit, they do have a primordial look to them. When surprised or scared, they bark like a dog and hop around in circles, it’s a sound from the past, eerily prehistoric and oddly appropriate for their looks. Where did they come from? I wonder if they are a genetic remnant from our ancient past, a treasure that has been rediscovered and/or a delicious unsolvable mystery. Regardless, we are lucky to have them. And by the way, what ever happened to the cute little piglets named Adam and Eve that got to go live in the Napa Valley? 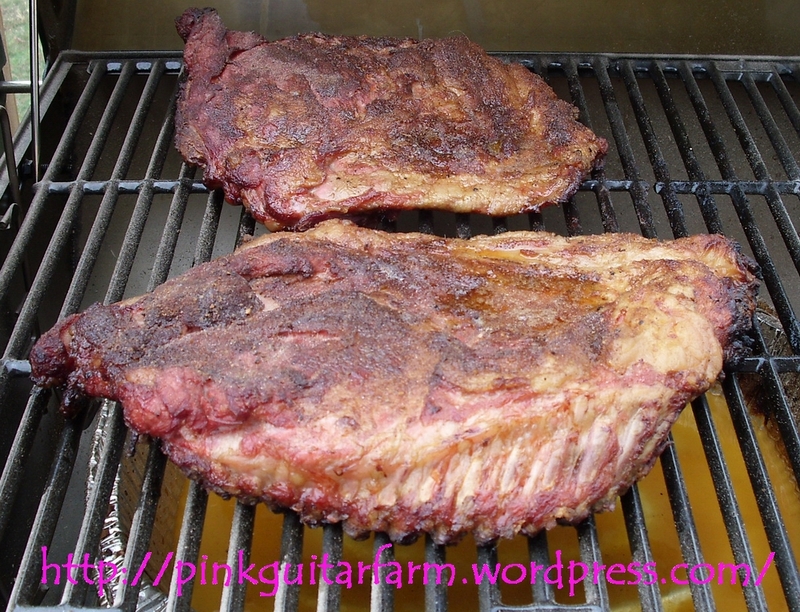 No, that’s two sides of pork ribs, smoked over a tray of pineapple juice with a brown-sugar spice rub. Farm raised pork. 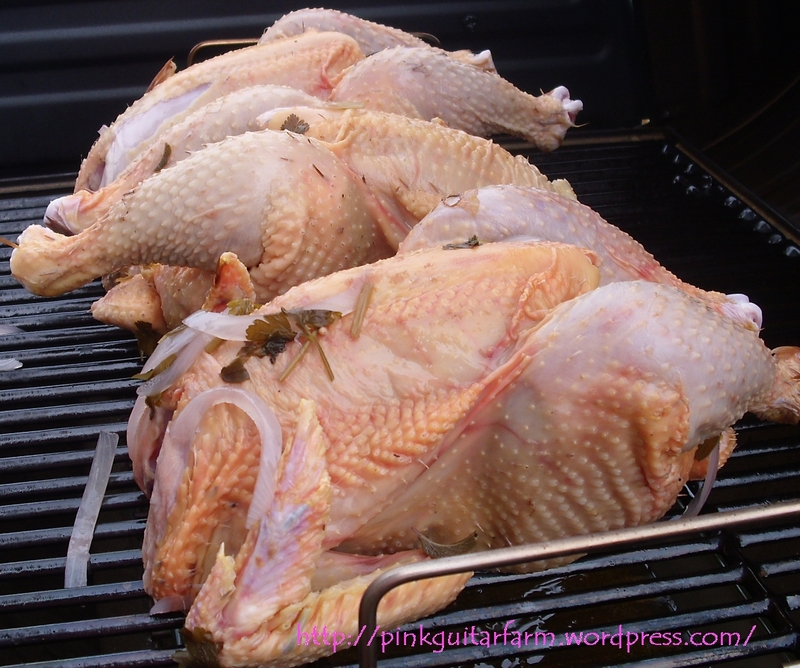 As in, raised here pork – on farm, yes! Historic for us because this was our first taste of pinkguitarfarm pork, over a year in the making (we’ve been patient). Was it delicious? 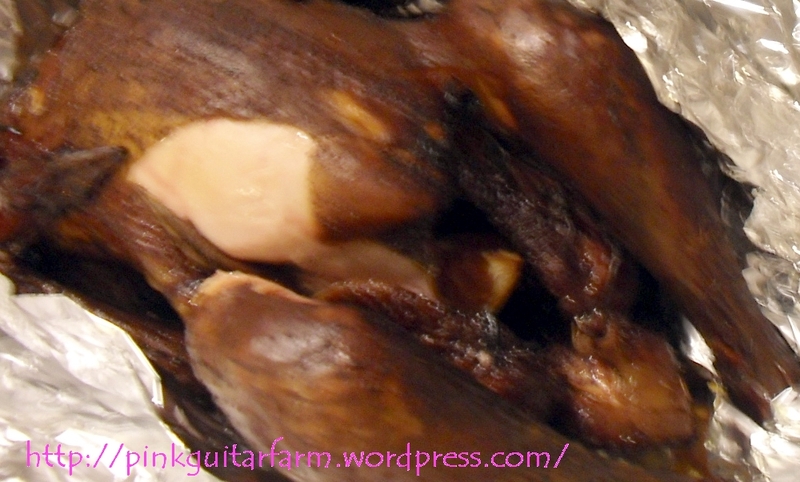 Well, I, the author and farmer, cannot tell you if this mouth watering picture translated into a savory, sticky, spicy – gnaw on the bone(s) food revelation. It got excellent reviews, though. Why? Because while I was making Pecan Pie, 5 individuals (3 under the age of 12) DEMOLISHED this entire appetizer dish. Nay, I can’t even call it a dish, these ribs DID NOT MAKE IT TO THE KITCHEN FOR PLATING. No utensils, napkins or dinnerware were utilized in the deconstruction of my special first course: pork ribs a la pinkguitarfarm! I suppose I was not too upset because the main course featured fresh roasted hams (same rub) served with a Champagne cranberry reduction, wilted Swiss chard with pinenuts, caramelized sweet potatoes and Caesar salad with homemade dressing and croutons. Needless to say, I did not go hungry and more importantly I am very thankful for the wonderful bounty our farm provided. As for the ribs….there will be more in the future. So, what about the contract negotiation? 1. Girlfriends – a whole gaggle of them. 2. My own food bowl. I’m done sharing with those stinkin’ chickens. 3. That blond kid, on a permanent time-out: in the house. 4. I ride shotgun in the truck, no more sitting in the bed. I had to give the fowl a long somewhat respectful once-over. He’s got wattles, man! 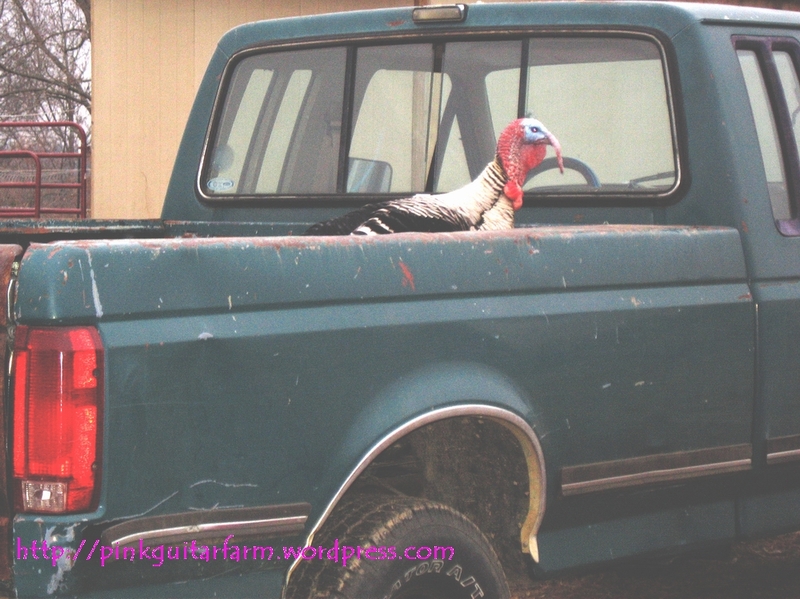 I must say, Brad caught me a bit off guard, but I was going to get him some turkey hens anyway. Next time, I’ll have my own demands ready so we can really negotiate, like: quit sleeping on my car, no harassing the children or the chickens and no gobbling while I’m outside on my cell phone, it freaks people out. 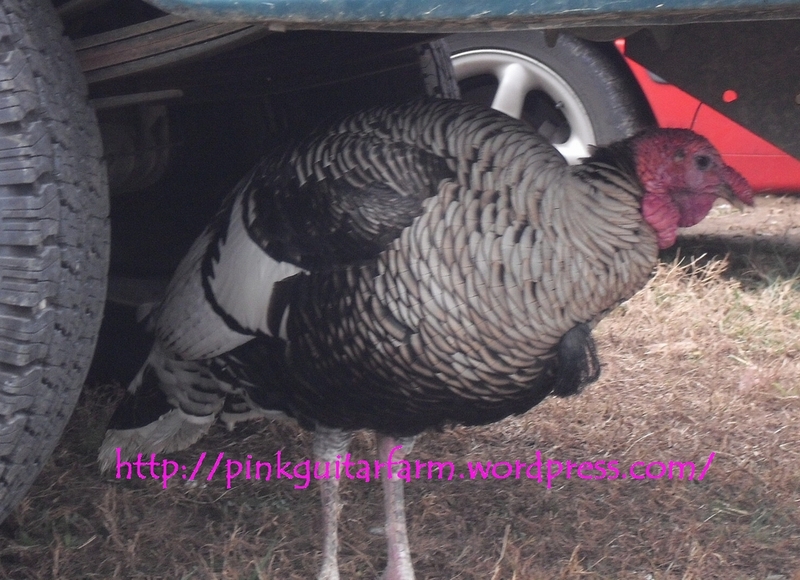 That Brad, he’s a tough nut…and people think turkeys are stupid? Contact: Ben & Emmaline Seaborn (931) 623-8112. 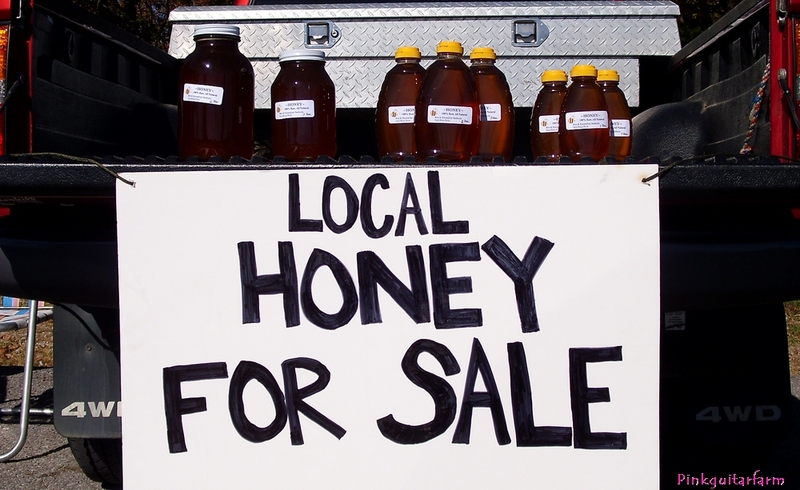 Ben and Emmaline also sell their amazing raw, all natural honey at the Fairview Farmers Market in Fairview, TN., at the Recreation Center parking lot on most Saturday mornings during the regular season. Mozzarella with farm-fresh cow’s milk…finally! After the PTO (Parent Teacher Organization) meeting last night at our kids’ elementary school, I happened to talk to a parent about buying beef from his farm. I am interested in a half a cow for the freezer. He mentioned that they sell milk too. YIPPIE! I went over to his farm this morning and picked up some precious cargo. 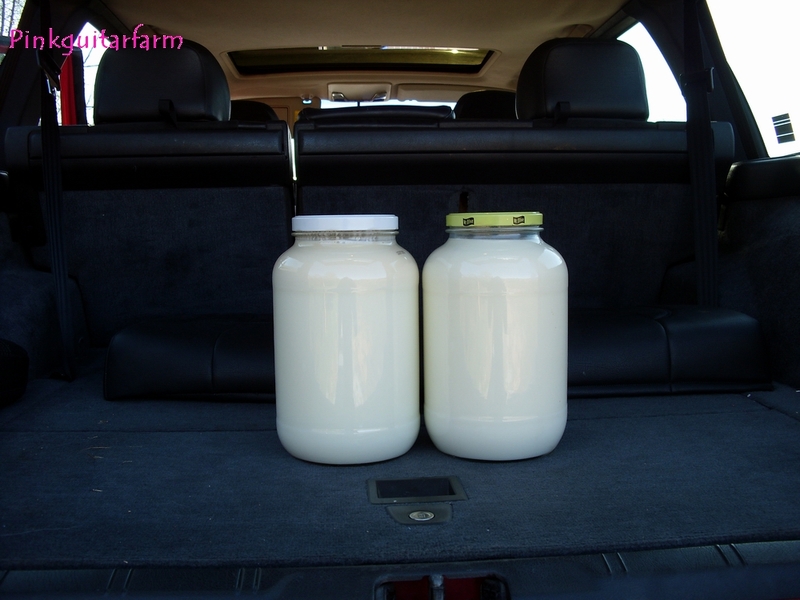 2 gallons of fresh (milked within the last 12 hours, fresh) whole milk – located only about 3 miles away, I had to pinch myself. I told him that I planned on being a very good customer since my husband is an excellent cheese maker (well, the only one I know of, really) and I can’t wait to give the piglets some whey. Piglets fed whey eventually make very tasty pork, or so I’m told! Which was a little dusty, and I spent this morning dreaming of “Mozzarella with farm-fresh cow’s milk”, Panir, an Indian cheese, Queso Blanco, “Whey Ricotta” (piglets are gonna have to share on this one) and Gouda. How about Caraway Swiss? Mascarpone? Lemon Cheese and Gorgonzola? I realize I’ll have to work up to Parmesan. If you are interested in checking out the site where I purchased my cheese making book and got my initial “Cheesemaking kit”, click here. Check with your local farmers or ask around at your farmers market to locate a source for farm fresh milk – it’s worth it!